Playgrounded is a band from Greece and was formed in 2007. First they lived in Greece but feelt the need to make a new start. They decided to come to The Netherlands and now living in Rotterdam. They made a record in 2013, Athens. I do not know this album, yet. Surely I will get my copy. 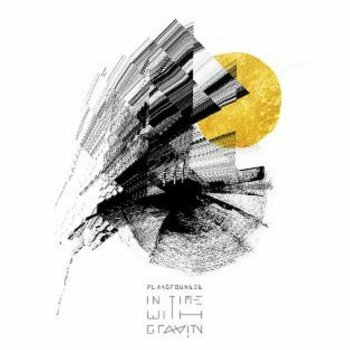 The follow up, In Time With Gravity was made in 2017. The band consists of Odysseas Zafeiriou on bass, Orestis Zafeiriou on keys and programmings, Giorgos Pouliasis on drums, Stavros Markonis on vocals and Michael Kotsirakis on guitars. On the supplied information I read that the band is an electronic / heavy rock band. I can totally agree with that. When I look for equations in the music I recognize Mariusz Duda and his solo project Lunatic Soul and then in particular the electronic parts. I also hear a lot of ambient in the music. At some points I do hear Robert James Moulding of the Australian band Anubis in the singing of Stavros. I will try to describe what the music is doing with me, what I experience. The album opens with Crossing. Ambiant sounds is what you hear, as well as a lot of electronics, also tight drum hits that are threatening. Whispering vocals, restrained and full of emotion. A driving guitar riff. Everything is slow but oh so emotional. Stavros regularly pulls it out of his toes, so deeply he sings. The drumming is really inventive and has an important role, even the driving bass lines. In Mute the slowness feels wonderful, it takes you along, as do the whispers and ambient sounds. You feel the depression which is very addictive. The threatening that you constantly feel makes you alert. Again heavy riffs on guitar with the electronics at the background. The song ends abruptly. Waves sounds powerful and really melancholy. The song draws you into your misery, lovely. The power drums lead you through the song. The leading role is for Stavros who sings really diversely in this song. There are many variations in sounds, sometimes full and heavy, then sweet and fragile. The song takes eight minutes but they are gone in a blink of an eye, so it feels. The longest track on the album is the title track, In Time With Gravity. There is so much variety in this song. I think it's a real piece of art with the capital letter A. Everything you hear in this song, except for a real guitar solo that we are used to in many other types of music that we listen to. The Greeks do not seem to like guitar solos. I can also imagine that because the music does not really lend itself to that. We do hear a real electronics solo. I never thought that electronics could have such an important role in music, but nothing is less true. An absolute highlight on the album. In Rotterdam your head will automatically shift to the hypnotic rhythms in combination with polyphonic vocals. There is an electronics solo in this song that requires maximum volume so you can let yourself go! All-in all I can lose myself in this type of music. It is overwhelming and emotional and it takes you on a journey that cannot be described into words. You have to love this music, it is not easy to get into it, but if you are into it, you will not let it go again. Great and fantastic album!